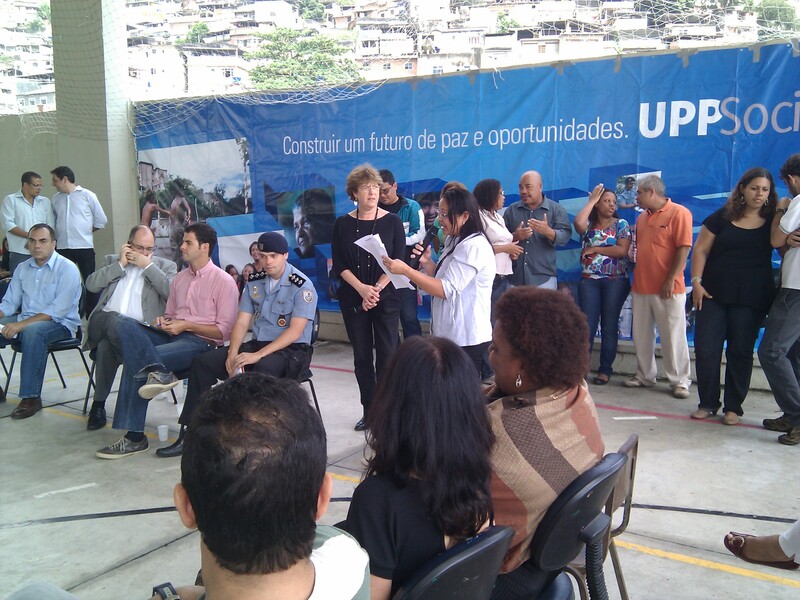 How does the social UPP program begin its work in a pacified favela? Morro do Borel, October 28, 2010: five months have gone by since the state military police occupied and pacified this area comprising seven favelas. The Borel occupation is part of the UPP program that has now “retaken” 12 territories of the city of Rio from drug traffickers. In an elementary school’s upstairs open-sided play area, chirping sparrows can be heard as they fly in and out. Bullets used to fly here. The arrival of the UPP in this area contiguous to the Tijuca section of Rio, now followed by social services, represents the start of a deep social change. And deep social change occurs only when led by exceptional people and their exceptional teams. It’s not a job for bureaucrats or populists. The idea is that Luís is no longer "nobody"
“No one.” Silvia puts the microphone in front of the boy and makes him says his name is Luís. 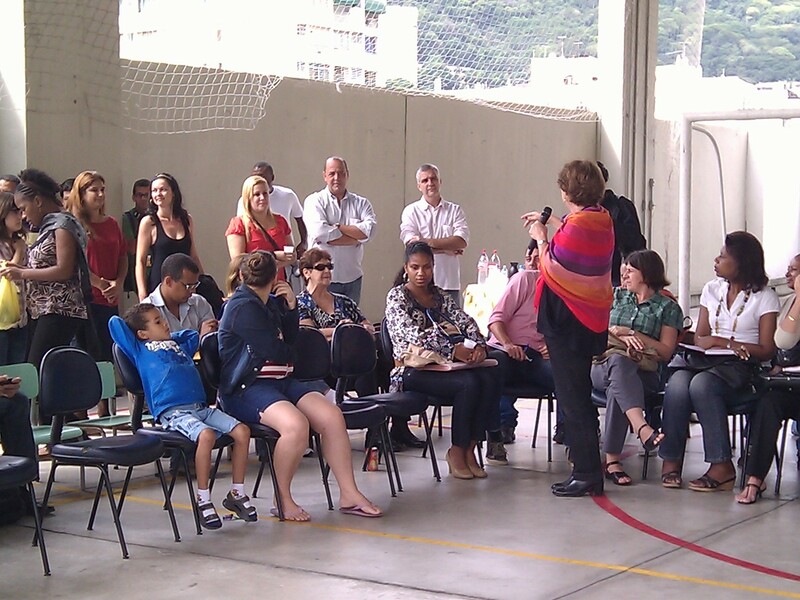 Present are a team from the World Bank, people from the electric company, the sewage and water company, the military police, the state industrial federation, the trash collection agency, the state and municipal health and education departments, the local city hall, representatives from the culture and tourism departments, NGOs and churches, the presidents of five favela neighborhood associations, and someone from an English language school. They’re all here, after decades of neglect of the seven communities that make up the Morro do Borel, where about 35,000 people live. In the twenties, the favela grew up near a cigarette factory owned by the French Borel brothers. Decades later another French name was in the area, the Carrefour hypermarket. But it closed about four years ago because of the constant threat posed by gunshots. Tijuca is full of white elephants like it. It would be an exaggeration to say that Ricardo Henriques, State Secretary for Social Assistance and Human Rights, is the Social UPP’s Martin Luther King. But watching him in action you come to the conclusion that the social followup, key to the success of the state public safety policy (itself key to the success of the 2014 World Cup and the 2016 Olympics), is hugely dependent on this man—both a dreamer and a doer. His brief is to sort out hundreds of existing (and often overlapping) programs offered by governments, NGOS and private companies, and to ensure that residents of pacified favelas have access to the same goods and services as everybody else. The governor has said the UPP communities have priority over the rest of the city. Henriques reminds those present that only three years ago such a meeting was unthinkable. “What we’re doing here is opening up a field for strong listening,” he says. This isn’t an idiomatic expression in Portuguese; in Brazil the listening has traditionally been done from the bottom up. Next comes his mea culpa for the government’s neglect. He emphasizes the new partnerships among the different levels of government and with the community, NGOs and the private sector. Then he explains that what’s happening is an integration of the city, of its asphalt and its hills, as cariocas like to call the formal city and the informal one. Last, he trumpets that Rio is leading a process that shows the way for the entire country. The next speaker is the state conservation secretary, to quickly sum up what he’s already doing: improved trash collection, the number one problem. The trucks often can’t get through the narrow streets, especially when residents park where they shouldn’t. Now there’s a second dumpster on the hill and an experimental third one down next to the school. There’ll be recycling. Borel produces nine tons of trash a day. Soon comes the moment of truth. There could be nasty arguments; the meeting could become a drawn-out bunch of complaints and recriminations. 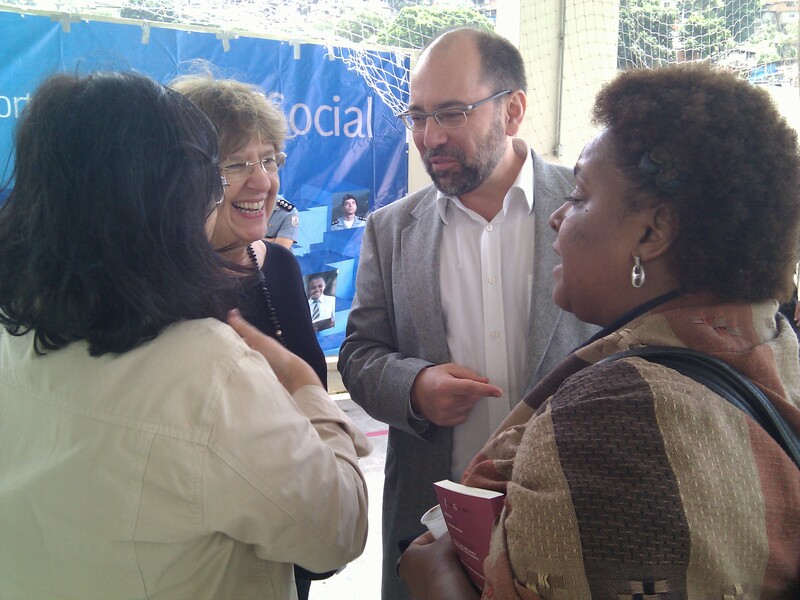 Brazilian meetings tend to be unruly, more focused on emotion than reason. Three sheets of paper appear; the residents have come prepared. A woman reads the communities’ wish list out loud. It’s just a beginning, she says: internships, jobs, remodeling and expansion of day care centers, entrepreneurship training, cultural and sports events, sewage systems, normal electric power service, trash collection, environmental education, the resolution of vehicular access issues, legal aid, womens’ health. The paper is put into Henriques’ hand. Then a water and sewage company executive speaks, confessing his shame at poor service. The lack of maintenance because of the danger (“Ten years ago, when the police arrived I used to tell my teams to get out, fast. Now we go in together.”) led to leakage and enormous waste of water. The electric company has seen the same phenomenon: people who don’t pay a light bill because they’re hooked up to the system informally simply turn on the air conditioning and leave their doors and windows wide open. For decades Rio de Janeiro has paid the price of poor public safety, in lost tourism and business, in walls, insurance, alarms, armored cars, guards, security cameras, mental and physical health, spotty education, corruption, deaths and injuries. Now the city is finding out that neglect is expensive in ways it hadn’t even imagined. Father Olinto, veteran of many a struggle in Borel, present there since the seventies, praises the police. He’s never done that. The microphone returns to Henriques. “Now it’s time for each person to do what he’s supposed to do,” he states. “That’s not in this city’s history, which is in itself a revolution.” The next meeting will be in February. Until then, working groups will meet. Henriques notes that the NGOs and the neighborhood associations are united, which is unusual. “That takes work,” he comments. “I can imagine the difficulties of that process.” For the first time, Monica smiles. 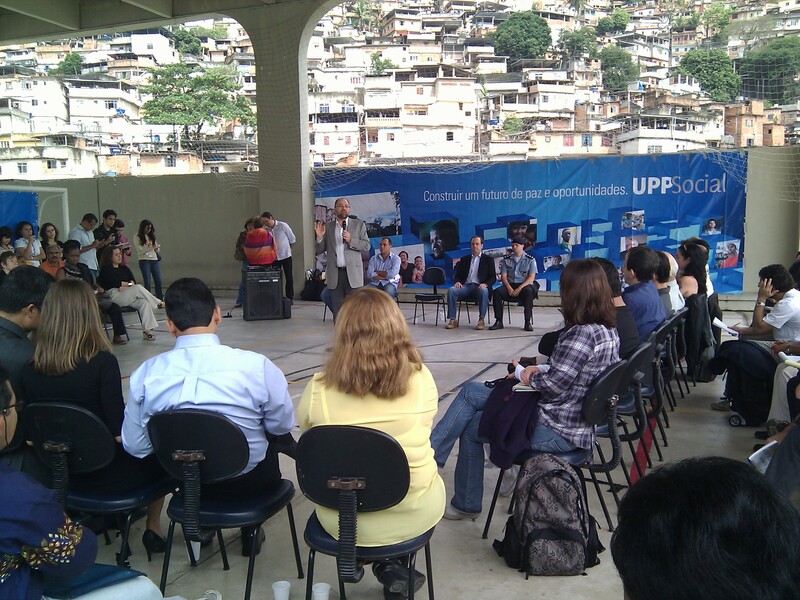 By February 2011 the Social UPP program will be present in ten favelas which have already been occupied and pacified. Borel is the third. 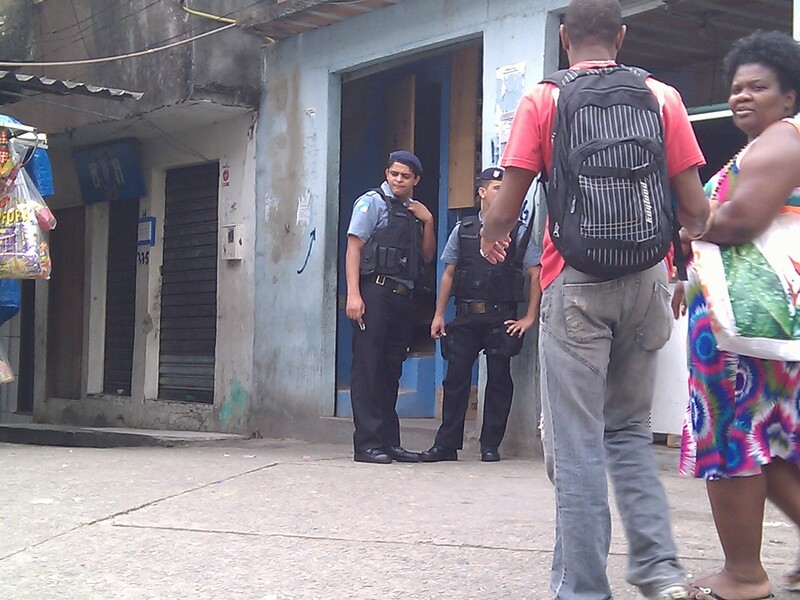 This entry was posted in Transformation of Rio de Janeiro / Transformação do Rio de Janeiro and tagged 2016 Olympics, A Rede, military police, Monica Francisco, Morro do Borel, pacification Rio de Janeiro, Padre Olinto, public safety Rio de Janeiro, Ricardo Henriques, Rio de Janeiro, Rio de Janeiro crime, Rio de Janeiro revitalization, Rio de Janeiro transformation, Sílvia Ramos, Tijuca, UPP, UPP social. Bookmark the permalink.